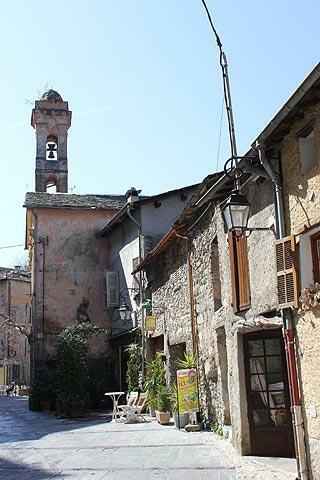 Saorge is a village in a stunning location inland from the French Riviera region around Menton and on the road towards Tende. 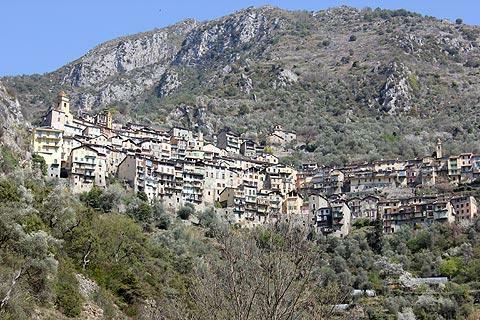 The village is towards the east of the Mercantour National Parc and overlooks the Roya Valley, in the mountains close to the border with Italy. Although the site had an earlier defensive role, much of the village we see today dates from the 15th - 16th centuries, and developed due to its position on the salt route that passed through here. Above all it is the picturesque setting of Saorge that will first attract your attention, a dramatic line of houses strung out along the hill far overhead as you drive north through the Roya Valley. Saorge is in a very pretty location on the steep wooded side of a mountain, and is known as one of the 'perched villages' of Provence because of its impressive location above the valley - although it is really on the side of a steep hill rather than on top of one as is more common with these villages. Note: parking is available at both ends of the village (more spaces at the center / west of Saorge), but there is no car route between the two without returning to the main road several kilometres below. 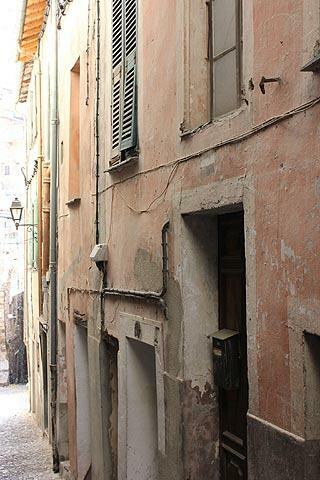 Exploring the village is straightforward as the village is pedestrianised and mostly follows along one long street that climbs the hill through Saorge, with lots of smaller alleys climbing the hill to either side. 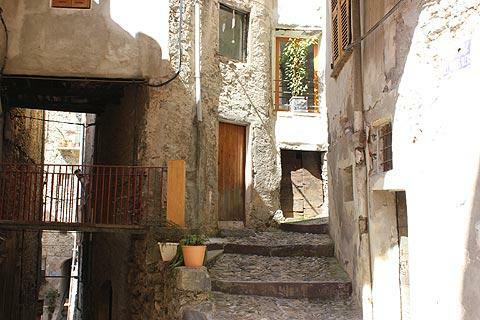 The tall solid stone houses date from the 15th-17th centuries and line the narrow steep cobbled street that climbs up through the village, and permit numerous impressive views and photo opportunities across the village with the mountains and valley as backdrop. A traditional 15th century village of the region, there are lots of fascinating and ornate details to be seen on the crowded medieval houses, such as in the decorative lintels above the doorways. There are two restaurants (the Bellevue restaurant has a terrace with exceptional views down the Roya valley) and a few art galleries but otherwise the village has little commercial development. Along the way be sure to stop and look at the artworks and highly reputed organ in the baroque style Church of Saint Sauveur on Place de l'Eglise. 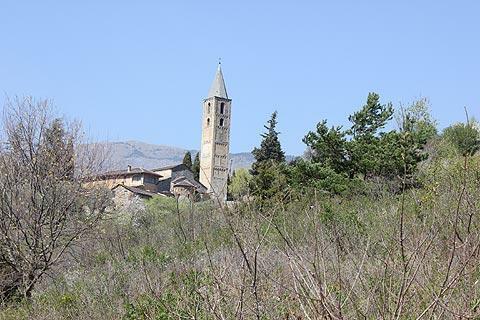 The church itself was rebuilt in 1465 after a fire destroyed an earlier church here. The organ is also used for giving occasional performances for visitors. 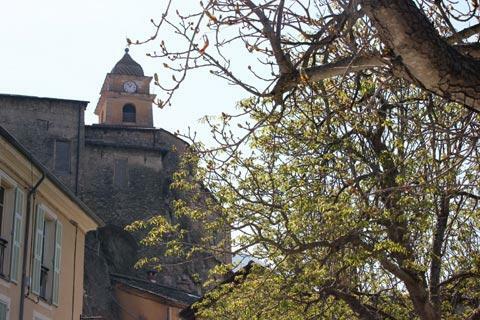 At the eastern end of Saorge you can see the pretty little roman style Chapel of Santa Maria del Poggio, a roman style chapel and adjacent belltower that contains some impressive frescoes, and several other small chapels can also be seen in the village. One of the best views of the town and its setting is from the terrace of the Franciscan monastery in the olive groves outside the eastern end of Saorge. This 17th century monastery is itself a classified historic French national monument and has some fine carved woodwork and frescoes in the interior. 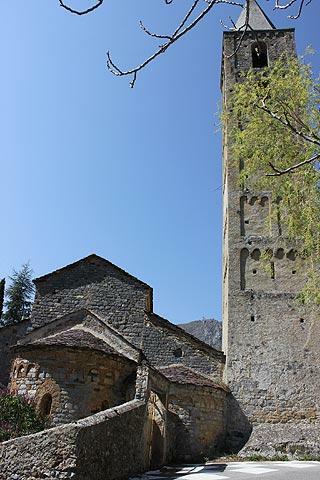 Saorge is a stop on the small tourist train route - the Train des Merveilles - that runs from Nice to Tende and the Valley of Marvels. Numerous hiking trails are accessible from the town, which is a good base for exploring the surrounding region and the eastern regions of the Mercantour National Parc. 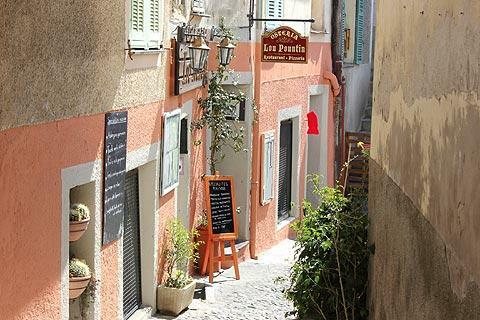 Less well known than Saorge, we also suggest a visit to the town of Breil-sur-Roya a few kilometres south along the Roya Valley.